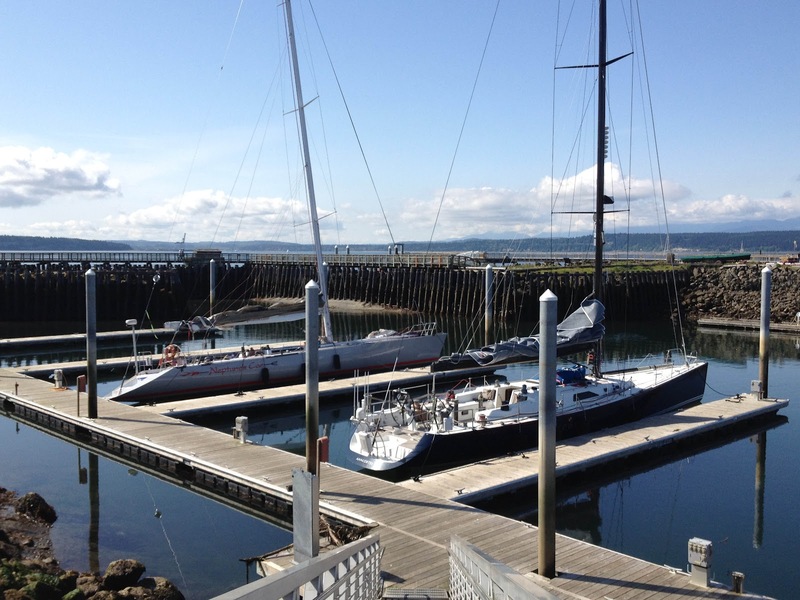 Each year we participate in the annual Race to the Straits event put on by the Sloop Tavern Yacht Club. This double-handed event consists of a two-day race based on combined times. 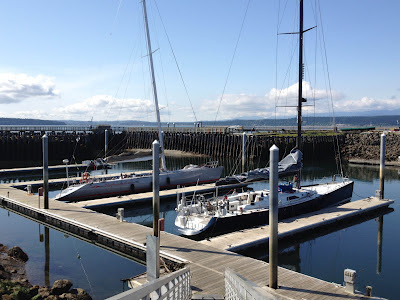 The first day we leave from Shilshole Marina and race to Port Townsend, then on the second day we race back. What is unusual about this event is that it is a reversed start -- this means that each boat is given a specific starting time. For us, typically being the fastest boat racing, it means starting literally hours after everyone else. For this race our start time was 10:40:55 each morning when some of the very slow boats were starting well before 8:00am! On Saturday we had a reasonably good start shortly after Neptune's Car and immediately hoisted our A1 spinnaker. We flew this spinnaker all the way to the finish some 5 hours later. After the start we immediately headed out into the middle of the channel to catch the remaining ebb current. We stayed wide of Point-No-Point and then ducked into the bay SE of the Double Bluff Buoy (the first mark of the course). By then we had a nice lead on the Car (they were being very conservative and using non-race sails with minimal jibing) and were starting to pick off other boats. After a nice rounding of the Double Bluff Buoy we immediately headed over to the west side of the channel, although in retrospect we should have ducked back inside and headed up the Whidbey Island side. We made some nice gains on the west side while watching Terramoto & Madronna streak up the Whidbey side. In the end we had to go out into the middle to get pressure (but bad adverse current), then ducked back into the lee of Marrowstone for current relief. We rounded Marrowstone bucking a nice flood then headed directly for the finish. In doing so we passed many boats and ended up finishing 3rd in our division and 9th overall -- easily in striking distance for the next day when the late start should greatly help us! The next morning the tide was down and heading further down -- we had carefully checked out depths on the way in (except when we backed into our slip). When it came time to head out for our start we ended up getting stuck in the mud and had to winch ourselves back into the slip. The Car was by then hard aground and both of us were clearly not going to make the second day of the race. It was early afternoon by the time the tide had come up sufficiently for us to leave the marina, but by then we were simply too late to catch the fleet -- however this was lucky for them as at the time of our start the entire fleet was still near the start drifting around in light winds. The Car & Icon would have crushed the fleet on the second day with the losers breeze coming from behind. In the end we headed straight back to Anacortes and got home at a reasonable hour with plenty of time to put the boat away -- another year!